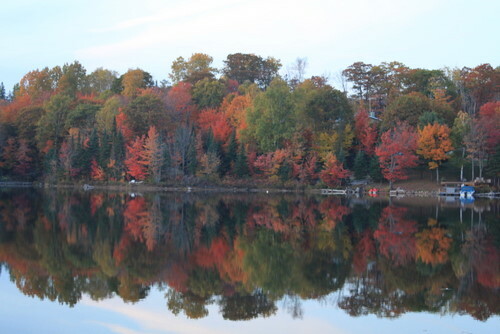 Fall colors in Ontario Canada. Waterfalls Lodge in Northern Ontario has some of the prettiest colors on the planet. The pictures don’t really do justice to the splendor of the fall colors. 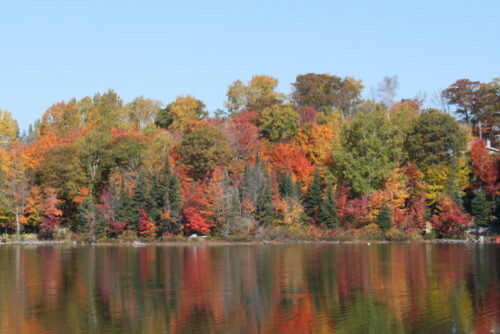 Typically the fall colors begin to turn towards the middle of September and extend well into the middle of October. This changes each year a little bit so be sure to stay tuned to our blog or Facebook Page for full details! 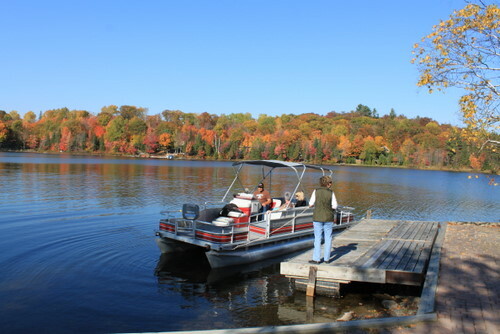 We have Pontoon boats and fishing boats for our guests to use to fish or explore our 5 lucky lakes with. Additional leaf viewing options are available by taking several driving tours. The Deer Trail is a famous artisan trail. 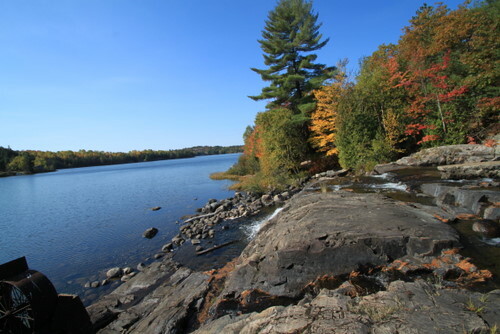 Full details are available on www.WaterfallsLodge.com or just come and stay with us and we will help you find the perfect Ontario Leaf Viewing experience. All of our cabins are lakeside. They all have great views of the leaves and provide dockage for our boats. Beautiful leaves and their reflection. View from Cabin 9 porch. Waterfalls Lodge was named for it’s Waterfall that used to be tapped for hydro power. This is the view from our Log Cabin that is perfect for anniversaries, honeymoons and romantic getaways. The Cabin is right by the Waterfall. We have been coming up here during this time for the last 3 years and the leaves are beautiful and then we go back to Indiana and enjoy a later fall color turn.